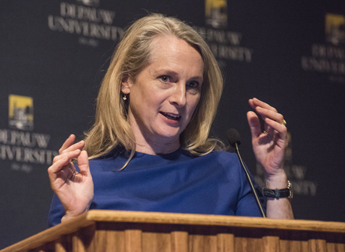 "What I simply tried to do was to invite the reader to step into my shoes or to step into the shoes of one of the other women who is depicted in the book," Piper Kerman, author of the bestselling memoir, Orange Is the New Black: My Year in a Woman's Prison, told an audience at DePauw University tonight. "And to do that, I simply tried to paint a picture of what is it like to live your life, day to day, in a prison. What is it like to be a prisoner?" Kerman, who served 13 months in a minimum security federal prison, discussed "Lessons Learned Behind Bars" in a Timothy and Sharon Ubben Lecture. Her book is also the basis for a hit television series on Netflix. A graduate of Smith College, Kerman told the crowd of 1,020 in Kresge Auditorium how she left college without a plan ("I really didn't have a clue what my next step would be") and wound up in a relationship with a drug dealer. In 1993, she was asked to carry a bag of money from Chicago to Brussels. Five years later, federal agents appeared at her door with an indictment. She pleaded guilty and was sent to prison, reporting exactly 11 years ago today -- February 4, 2004. 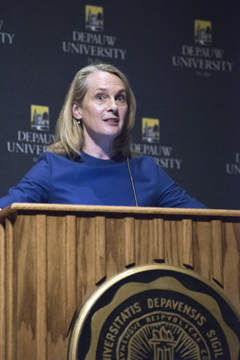 "The consequences of our actions always come back to us, in one form or another," Kerman told the audience, which was dominated by DePauw students. "And sometimes it takes a lot longer than you think." She added, "This was the beginning of my journey through the American criminal justice system, a system that, ironically, I knew very little about. Should any of you be pondering any big steps out there, I just want you to be very clear about the sanctions you face." 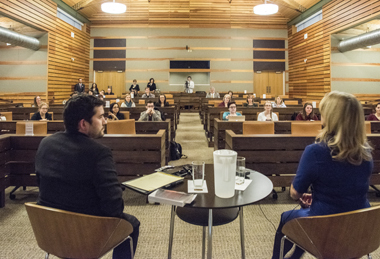 Using stark descriptions, empathy and humor, Kerman guided her DePauw audience through the prison experience, noting, "It's a community that no one wants to be a part of, and yet it is a community nonetheless. "Prisons and jails are extremely harsh places to be. They are traumatic places to live, and that is very intentional. We build prisons and jails to be traumatic places, very much by choice." More people are imprisoned in the United States than in any other nation in the world, she told the crowd. America has 5% of the world's population, yet 25% of the world's prisoners. A third of the world's female prisoners are behind bars in the USA and the prison population of women has increased by 800% over the past 30 years. There were 500,000 people in American jails in prison in 1980 versus 2.4 million today, a period in which the nation's crime rate declined, Kerman pointed out. "Over the last 30 years, we have chosen to incarcerate people -- lock people away in prisons and jails -- who we never would have put in prison before, she stated. "It is quite shocking how easy it is to get locked up in this country for a low-level offense," Kerman asserted, and noted that two-thirds of women who are behind bars are in that category. "When we incarcerate a woman, it usually does not affect just that individual." "When a mom gets locked up, it has a seismic effect on her and her kids. And the children of a woman in prison are five times more likely to go into the foster care system than when we lock up a dad." Kerman maintains an individual's race and class are important issues in determining who is sent to prison and how long they are sentenced to serve. As an example, she said that African Americans are four times more likely to be arrested for possession of marijuana than whites. "I hope I don't need to convince anyone in this room that white people smoke just as much marijuana as anyone else, because they do -- the data shows that really clearly, too. But that disparity shows you, loud and clear, what we know from the history of our country, which is that the criminal justice system has been used as a tool of control over poor communities of color. And that was true for many years because racial inequality was the law of the land and law enforcement was used to enforce that. The law of the land now is that racial equality is the way things are supposed to be. In too many ways, the criminal justice system has not caught up, and it needs to." Kerman now dedicates much of her time to advocating for prison reform and is a board member of the advocacy group, the Women’s Prison Association. While she made many friends behind bars who she still keeps in touch with, Kerman described the isolation an inmate feels, and how things like letters, visits are reading books are important to keeping connections between prisoners and the world beyond the facility they're housed in. Those lifelines "are so critical to keeping a prisoner cognizant of the fact that they will someday get out of this hellhole and go back to the community -- they will return to the family and the people who write them, and the people who visit them, and the people who need them," she said, and be less likely to wind up back behind bars. The system is flawed, Kerman says, because it doesn't work to rehabilitate or help those who are incarcerated. Many of the 700,000 people released from prison each year have trouble readjusting to society. "Prisoners want and seek productive outlets for their energy, for their time -- something that will make that prison sentence not be a total waste of time. And far too few prisons and jails do anything to create those channels for positive energy." After she was released from prison, Kerman says she faced questions from curious family and friends about what the experience was like. That prompted her to write Orange Is the New Black, and she says the letters she sent from jail were invaluable as she collected her thoughts. 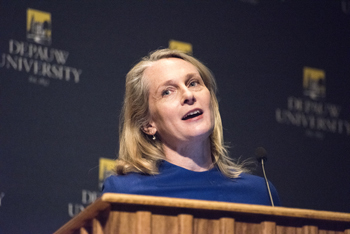 "I hoped that after reading the book someone might come away with a different idea about who is in prison in this country," Kerman told the audience in Kresge Auditorium. "Why are they there? What are the pathways that people find and follow into prison? And what really happens to people behind the walls? I also hoped that I might be able to get someone to pick up a book about prison that might not otherwise read a book about prison." 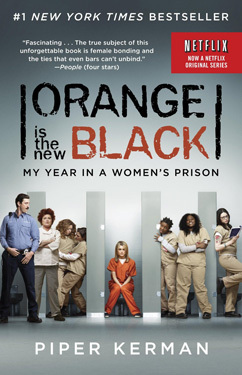 The acclaimed television show Orange Is the New Black uses Kerman's book as a foundation but there are many differences between it and her book. "The show is not a biopic, it's an adaptation, and I don't think a faithful biopic would work very well," Kerman stated. "I feel a tremendous amount of gratitude that the show is good and that the show is true to the spirit of the book." Having a bestselling book become an Emmy-nominated show serves to shine more light on an issue that is hidden -- literally -- behind walls and away from society's gaze. "I think that popular culture helps people think about these issues differently," the author noted. "And so I hope that's my contribution, helping to move these conversations outside of academia, outside of government, outside of, you know, the communities which are most directly impacted and into a much broader conversation. Because the criminal justice system affects all of us even if we are lucky enough to never set foot in a prison or a jail." 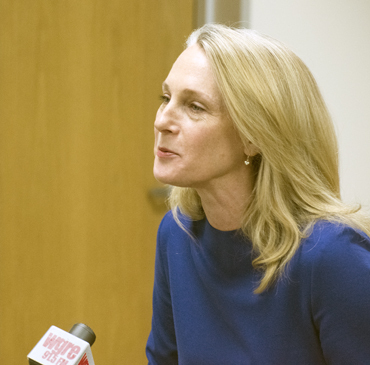 Piper Kerman's day at DePauw began with a session with student journalists. 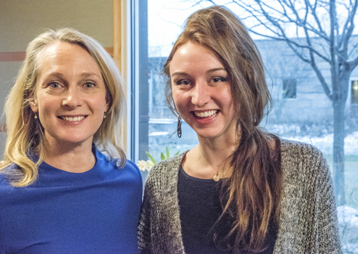 She then participated in a student forum at the Janet Prindle Institute for Ethics and joined students, faculty and staff for a dinner there. 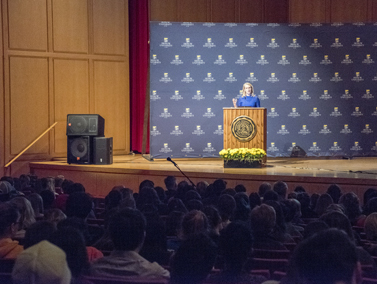 She called DePauw "an amazing college campus," and said during her Ubben Lecture, "I spent a fascinating afternoon up at the Prindle Institute. If you have not been up to that -- very beautiful, very tranquil place -- I suggest you do. It's lovely." Kerman added, "You are all participating in an amazing institution which shapes your lives. Being here is going to help you be the best people you're capable of, it's gonna help you accomplish the things that you want to do, and that is great. And you're also shaping this institution and that's also fantastic." Great institutions make communities better and safer, Kerman told the crowd, and decrease the chances people will wind up in institutions like the one she spent 13 months in. "You're all gonna go on one day to run these institutions and to advocate for making sure that all Americans have the good ones and don't wind up in the bad ones." The evening ended with a book signing event in the Green Center for the Performing Arts. 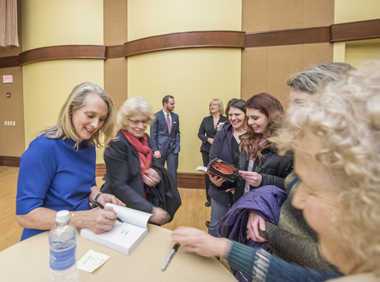 Kerman took time to talk with each person who waited in a long line; she signed her last book at 11 p.m., two hours after the Ubben Lecture had wrapped up. The next program, on March 31, will bring Dan Quayle, the 44th Vice President of the United States, back to his alma mater. Indianapolis Colts quarterback Andrew Luck will share "Creating Your Personal Game Plan for Success" in a Friday, April 24 visit. 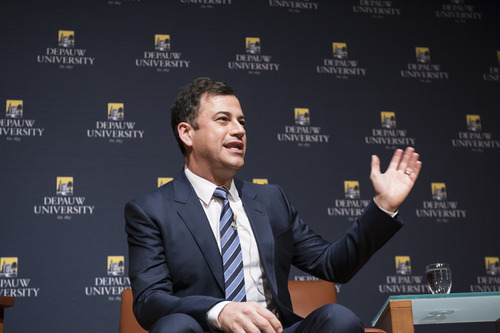 The 2014-15 academic year has already included Ubben Lectures by television's Jimmy Kimmel (pictured at left)and New York Times columnist David Brooks. 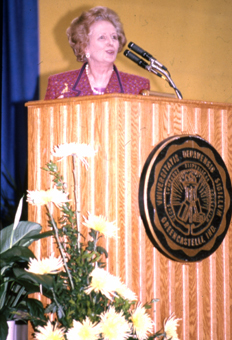 Previous Ubben Lecturers have included Bill Clinton, Margaret Thatcher (seen below right), Jane Goodall, Tony Blair, Benazir Bhutto, Shimon Peres, Mikhail Gorbachev, Spike Lee, Elie Wiesel, Robert Gates, Jesse Jackson, Willy Brandt, Naomi Wolf, Ross Perot, Michio Kaku, Ralph Nader, Jim Lovell, Ron Paul, General Colin Powell, John Major, Mike Krzyzewski, Oscar Arias, Brian Mulroney, F.W. de Klerk, Ambassador L. Paul Bremer, General Wesley Clark, Bob Woodward, Karl Rove, Mitch Albom, Julian Bond, Howard Dean, Doris Kearns Goodwin, David S. Broder, Jane Pauley, Todd Rundgren, William J. Bennett, ice cream entrepreneurs Ben Cohen & Jerry Greenfield, Eric Schlosser, Harry Belafonte, Martin Luther King III, Peyton Manning, Liz Murray, Paul Volcker, David McCullough, Carl Bernstein, Zbigniew Brzezinski, David Gergen, Sam Donaldson, Lee Hamilton '52, Jimmy Wales, David S. Broder, Jason Reitman, Leymah Gbowee, Bret Baier '92, Greg Mortenson, Candy Crowley, Sister Helen Prejean, Bill Bradley, Ferid Murad '58, Gwen Ifill, Allen Neuharth, Andrew Young, Paul Tsongas, Jim Alling '83, Rebecca Skloot, William S. Cohen, Richard Lamm, George Will, Ken Burns, Carl Rowan and many others.